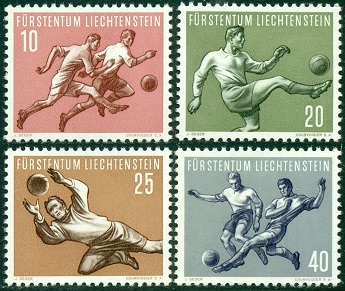 An additional set of Liechtenstein stamps, featuring rare paintings in the Principality of Lichtenstein Art Gallery in Vaduz, was issued on February 5, 1953. They are shown above (Sc. #266-69). 10 Rp. - Portrait of a Young Man by a 16th Century artist. 20 Rp. - St. Nicholas by Zeitblom (1450-1519). 30 Rp. - St. Christopher by Cranach (1472-1553). The four stamps shown above (Sc. #270-73) were issued on August 4, 1953 to celebrate the International Scout Conference in Vaduz. 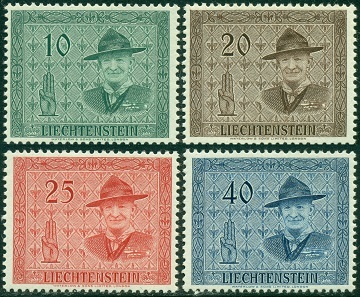 All of the stamps depict Lord Baden-Powell (1857-1941), the founder of the Boy Scout movement. The three stamps shown above (Sc. #274-76) were issued on November 26, 1953 to celebrate the Opening of the National Museum in Vaduz. 10 Rp. - Alemannic bronze disk, 6th Century A.D.
20 Rp. - Prehistoric settlement of Borscht near Schellenberg. 1.20 Fr. - Rössen Jug, around 3,000 B.C. The first in an annual series of stamps featuring sports themes was issued on May 18,1954. Each of the stamps shown above (Sc. #277-80) depict soccer players in various playing positions. On September 18, 1954, the 1951 semi-postal stamp issues, depicting rare paintings in the Principality of Lichtenstein Art Gallery in Vaduz, were re-issued and re-valued with new regular postage denominations, as shown above (Sc. #281-83). 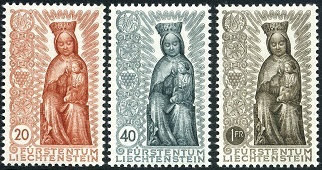 These three stamps were issued December 16, 1954, near Christmas-time, to celebrate the upcoming Marian Year. Each of the stamps show a 14th Century wood carving of an enthroned Madonna.